AmCham is currently accepting applications for the 2018 Corporate Social Responsibility Recognition Awards. Last December, at a ceremony presided over by United States Ambassador Daniel J. Kritenbrink, 26 member firms received our CSR Recognition Award for understanding the linkages between business operations and society, and conducting business in a way that creates both long-term economic and social value. Click HERE to view the list of awardees in 2017 and click HERE to view images from the award ceremony. To qualify for AmCham’s 2018 CSR Recognition Award, a member company’s CSR program must receive high marks in four separate categories: (1) Attention to business objectives and societal needs; (2) Creation of long-term economic and social gains; (3) Communication and sharing of best practices; (4) Program sustainability. 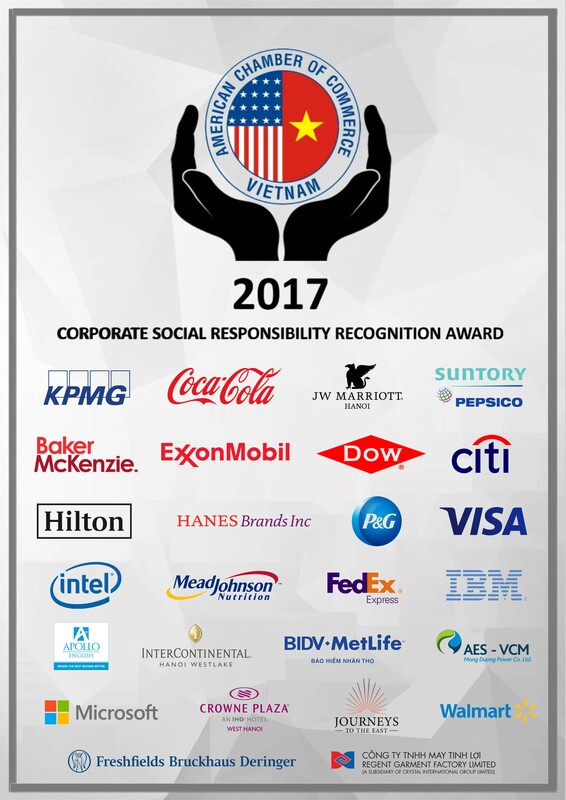 AmCham’s Corporate Social Responsibility Recognition Award Program is designed to raise awareness of CSR among AmCham members and the community, and to provide recognition to firms with best practice CSR programs in Vietnam. The program is only open to AmCham members. Member companies apply by completing an on-line application with automated scoring. The program is designed to provide recognition for all firms big or small – which achieve a baseline level of CSR performance. Interested AmCham members must complete an online application which can be found by clicking HERE.